Civil litigation, broadly speaking, is litigation over any matter not under the umbrella of criminal law. It can involve bankruptcy, commercial and business law, construction law, employment law, family law, insurance disputes, estates and probate, financial transactions, insurance disputes, personal injury, real estate, torts, wrongful death, and other matters. The hallmark of civil litigation is that the case involves an issue that the parties anticipate will need to be resolved through adversarial court proceedings, including trial. Whether your case involves fraud, assault, unlawful employment action, or something else, having an experienced trial attorney such as Christopher J. Cadem on your side is imperative. 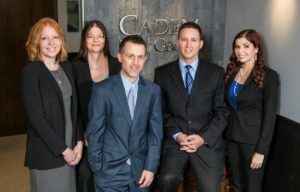 Cadem Law Group has a state-wide legal practice and experience handling civil cases for both plaintiffs and defendants. Attorney Christopher Cadem is licensed to practice in all Minnesota Courts, including the Court of Appeals and Supreme Court. Contact our office online or call 218-739-HELP (4357) to schedule a free consultation to discuss your case today. Key Practice Topics: Litigation; Civil Disputes; Torts; Insurance Disputes; Employment Law; Business Law; Financial Transactions; Personal Injury; Car Accidents; Slip and Fall; Real Estate; Personal Injury; Trials; Appeals; Insurance Company Contracts; Insurance Defense; Plaintiff; Defendant.